This page allows store admins to create coupons to grant their customers special discounts. Coupons can be created that are valid for any purchase, or they can be restricted to specific items. Note: The software does not support 'buy one get one'-type promotions. This type of coupon would require customization. On the main coupon management page, coupons can be found through the Search box, or by using the links on the right to view coupons grouped by letter of the alphabet. Store admins can also click 'Add New' to generate a new coupon, 'Edit' an existing one, or 'Delete' a coupon entirely. Clicking Add New or Edit on the page pictured above will display the fields below. Coupon Code This is the name of the coupon. Customers will have to enter this on the checkout page to use the coupon, so do not make it too complex. Coupon Type Product-level coupons use the restrictions described below to limit which products the coupon applies to. IMPORTANT: The discount value is applied to EACH valid product for Product-level coupons! Order-level coupons apply to ALL orders, regardless of what is in the cart. The discount value is applied to the order sub-total. 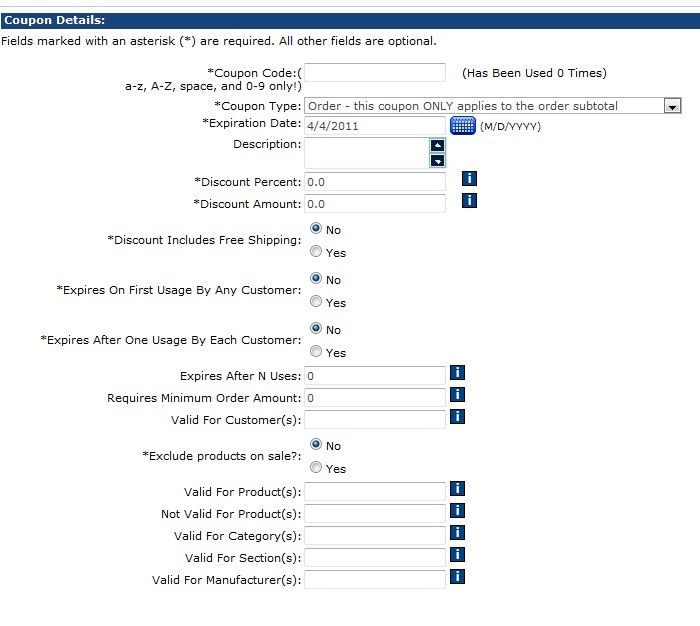 Any entity restrictions entered in the fields below are ignored for order-level coupons!! Expiration Date The coupon will expire at 12:00:00 the morning of the date entered in this field. If you want a coupon to expire 4/30 at 11:59:59, enter 5/1 as the expiration date. Description This field is used for notes to describe the coupon. Customers will see this on the receipt. Discount Percent If the coupon is for a percentage, enter the value here. Discount Amount If the coupon is a flat amount off of the total, enter the value here. Discount Includes Free Shipping If this is set to true, the coupon grants free shipping for the ENTIRE order, in addition to any discounts given above. Expires on First Usage By Any Customer If this is true, the coupon can only be used once total. Expires After One Usage By Each Customer If this is true, the coupon can only be used once per customer. Expires after N Uses If this field is not blank, the coupon can only be used N times total on the site, between any combination of customers. Requires Minimum Order Amount If this is not set to 0.00, then the coupon will only work on orders that exceed this amount. Valid For Customer(s) If the coupon is only valid for specific customers, list their IDs here. Exclude products on sale? If this is set to true, products with sale prices will be excluded from this coupon. Valid For Product(s) If this field is not blank, then only the product ID's listed here will be valid for this coupon. Products not on this list will not receive a discount. Not Valid For Product(s) Any products listed in this field will be excluded from this coupon, even if they would normally qualify based on other coupon settings. Valid For Category(s) If this field is not blank, then only the category ID's listed here will be valid for this coupon. Categories not on this list will not receive a discount. Valid For Section(s) If this field is not blank, then only the department ID's listed here will be valid for this coupon. Departments not on this list will not receive a discount. Valid For Manufacturer(s) If this field is not blank, then only the manufacturer ID's listed here will be valid for this coupon. Manufacturers not on this list will not receive a discount. NOTE: Each of the last 4 fields is checked individually, they do not combine. If an order qualifies based on one of the fields but not on another, it will still get the discount. 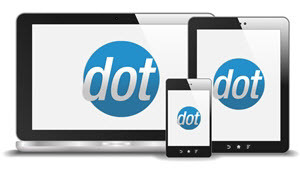 Customers enter coupon codes on the shopping cart page.